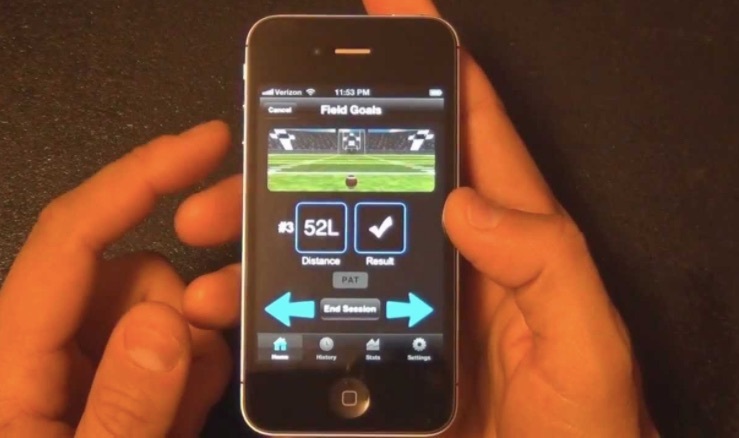 Owner of Kicking World, Brent Grablachoff, released a kicking app called Kick Tracker today on the iOS App Store. He has been working on this technology for over a year. With thoughtful feedback from his students and other coaches in the industry, he’s been able to design the first and only kicking app that allows kickers and punters to track and analyze their stats and share them with their coaches. Brent Grablachoff has a history of innovation and marketing, launching a grassroots campaign to establish the company Kicking World and also writing a book and authoring a 2 hour DVD on the subject of kicking. Brent has previous experience at Fortune 500 companies including Merrill Lynch, CDW, and Honda; as well as having headed up marketing and business development for two tech startups in the online video space. Brent coaches over 1,200 students a year and there are over 5,000 active HS kickers and punters across the country every year. His hope is that not only his students adopt the new technology, but also his competitors’ and their coaches and student base give it a try. Brent said he plans to keep it brand neutral and Kick Tracker focused so that more coaches outside of Kicking World will be encouraged to recommend it to their students. At this time he is unsure if he will white label the technology or not and may consider offering the application to college football teams.